YF-14A : Prototypes and pre-production aircraft. 12 built. F-14A + Plus or F-14B : Upgraded version of the F-14A with GE F110-400 engines. Much of the avionics as well as the AWG-9 radar were retained. 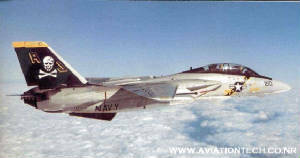 Later redesignated F-14B.